Confluence Rotary Mardi Gras Party! Thirty-one rotarians and guests attended this week. President-elect Bealinda Tidd led the meeting, starting with a Rotary Moment focused on the origin of the Four Way Test. Bryan Campbell from the Wenatchee Downtown Club. Joy Robinson from Teams Learning Center. Ryan Price from Sunrise Rotary. Cara Hackenmiller with Joyful Scholars. Keni Sturgeon, new executive director of the Wenatchee Valley Museum and Cultural Center. Sherleen and J.D. Taylor of Elite Hoop Effects and the Wenatchee Sunburn Classic. Tyler Alos, proposed member with Mitchell, Reed and Schmitten Insurance. Shannon had a buck for her trip to Duke University recently (where she got to meet Coach K) and another buck for a road trip she took from Bend, Oregon to Bellevue, Washington. The second buck/story involved a very precocious 3rd grader. Rob had an “unhappy buck” because Bealinda will be gone for a week for training and he might starve to death because he doesn’t know how to cook for himself. He also had a happy buck for Alina’s latest youth exchange update. Last Saturday Alina learned the semantic difference between “passed away” and “passed out” after she told a friend about her host home dad who had “passed away” from painful arm injury. He was not dead, he had merely “passed out.” Alina also recently joined the golf team at WHS and has yet to hit the golf course because of the snow, but rest assured they are hard at work practicing golf inside for the time being. France had a Happy Buck to celebrate and thank Rob for sharing his rink story for the Kraft Hockeyville USA Contest which ends March 2. Please share your story and help our local rink and events center win big! Nick’s Bricks at Pybus Public Market is this Saturday. It’s an event near and dear to all our hearts and a wonderful memorial for Nick Vitulli. If you’re not volunteering, please stop by and see and support this beautiful homage to Nick and his love of LEGOs on Saturday. Our annual club party this year is coming up next week and it’s a Mardi Gras extravaganza at the Red Lion Hotel! The cost is $25 per person and there will be appetizers, a no-host bar, music, and socializing. Everyone is encouraged to dress up and invite friends and family, find details here on our Facebook page. Therefore no regular Wednesday meeting next week! Two-thirds of the way through announcements we shifted over to a Confluence Rotary Foundation board meeting and David Bentson asked for nominations for new foundation board members. The foundation was started a few years ago thanks to a $50,000 donation from Barbara and Earl Tilly. The Foundation is close to reaching its goal of $100,000 of funds raised/donated since then the Foundation’s impact has included providing the Town Toyota Center with “Learn How To Skate” aids for local children. This is a recent story in the Wenatchee World about a local man battling mental illness who has slept in an apple bin in the middle of the Memorial Park since last October. Our help. For less than $700 we can sponsor an intervention training to prepare volunteers to deal with mental health crises situations. That could prevent more situations like Blaine’s. Blaine’s not currently sleeping in an apple bin at night. Because of Reilly Kneedler’s story he’s been taken in by former coworkers. That’s the power of the pen, coupled with empathy. Blaine might be out of the apple bin, but he’s not out of the woods. You can read Reilly’s follow up here. - Notes by vice president Dominick Bonny. 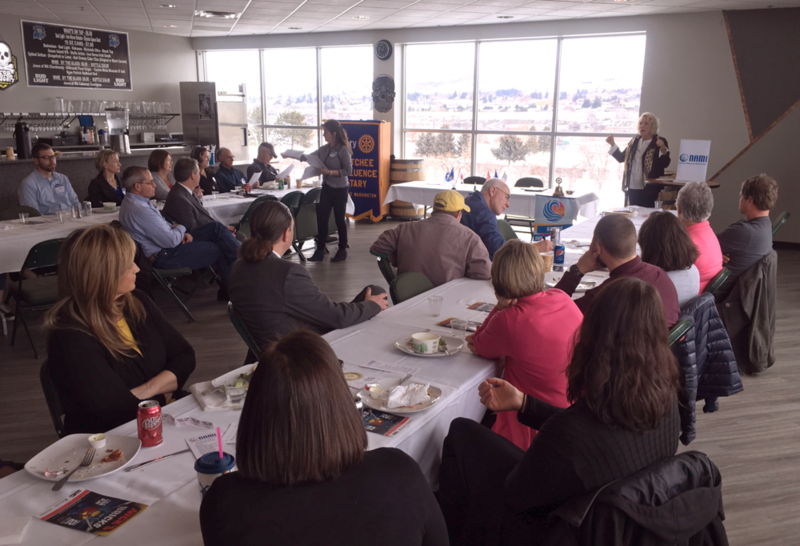 Help us tell the story of Wenatchee Confluence Rotary. If you attend meeting regularly please volunteer for the communications committee and help take notes. Not everyone can make it to every meeting and it’s important everyone is in the loop. Email Dom (dominick@digitalmedianorthwest.com) and/or Cindy at (cherdt@towntoyotacenter.com) and join become an official club scribbler! Motion by Rob Tidd as submitted, second by Katie Atkinson. Motion passed. Motion to Eric Limon & 2nd by Patrick Bodell. Motion passes. Waiting to hear back from Roseburg Rotary group. Motion to approve Drew Vader by Katie Atkinson second by Kellen, this will take effect once Rob is able to work with Town Toyota Center on their current corporate membership. 5) Club Elections – Establishment of Nominees – are there others? Lindsay will work on coming up with some sort of party for January or February. Rob – needs to get together a core group to help grow our membership. Katie - Public Relation/Public Image – will work with Kat and Dominick to help post and email information out to members. Richard will investigate getting our club setup with ClubRunner email communication tools. Rob applied for a public image grant that will be used for a Rotary open house at Pybus with all 9 clubs in the area to share their information. Patrick – World Service – will have a meeting and discuss projects we want to be involved with. Patrick – Youth Exchange – Our next year outbound student will be Hannah Johnson that will be going to Chile. Richard mentioned that we should consider allowing Hannah’s parents on as honorary members to the club while their daughter is away. Richard wanted to schedule a conference committee for the district conference, Monday January 7th afternoon. 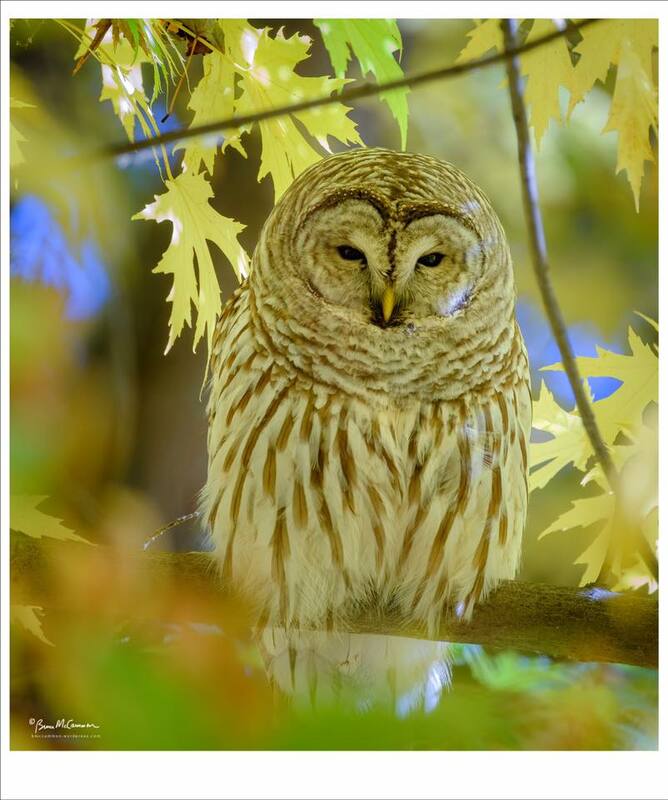 Meeting notes for Dec. 19 – 2019 Club Elections! Our inbound exchange student, Alina, from Finland, was our presenter ahead of the holidays! Our club’s outbound student Hannah Johnson from WHS is heading to Chile in the summer for the year! Katie A - $25 per ticket for suite seats with Sunrise rotary at the wild game in January. Kris Cameron had a buck in thanks that her son gets the holiday off. Alina’s had a greenback because her brother got engaged! Cam’s wife Stacy just accepted a new job! Congrats Stacy. Shannon McMannus is thankful for the help of people and the local church aftermath of the tornado in Port Orchard. Richard had a buck in celebration of his daughter’s 30th birthday, which was last week and they celebrated with some Swiss cuisine (reminiscing her exchange to Switzerland) together. The club was treated to an interesting and informative presentation from inbound exchange student Alina Heikkurinen on Dec. 19. If you haven’t talked to Alina yet, please make an effort to attend and ask her about her fascinating country and culture! Sometimes when you finish a book, you set it down and rarely, if ever, think about it again. This is not one of those books. This is a book that sticks with you forever. This is a book that will make your blood boil. It’s a book that will make you consider the plight of, and despair for, abused and neglected children everywhere. This is a book that will open your eyes a bit to how our society, in some sectors, has backslid into the kind of ignorance, superstition and religious fanaticism one would expect from 14th century Europe. Hats off to Dr. Tara Westover, the author and subject of this enlightening memoir. I don’t think I’d have the bravery and persistence to break out of such an incredibly toxic childhood, never setting foot in a classroom until I was 17, and go on to attend Cambridge and eventually earn a doctorate in history from Harvard. As a member of an organization that values and supports access to education for all, I highly recommend picking up this book in 2019, if you haven’t read it already. Meeting notes by board member Kathryn Bonny, unsolicited book review by vice president Dominick Bonny. 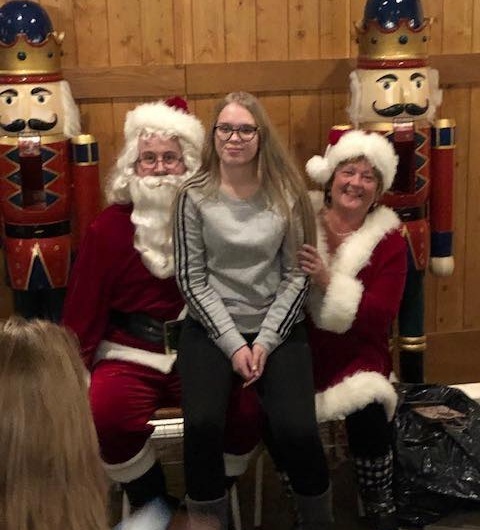 Our inbound exchange student Alina got back from a Rotary weekend in Canada where she met Santa! And as you can see from the photo below, she was thrilled. There was also a lot of skiing! Martin Barron had $1 and a shout out for the figure skating club’s awesome show this past weekend. Shannon also had $1 for bell ringing, she took a shift at Wal-Mart on Saturday. Bryan Campbell had $1 for his recent Caribbean vacation. Ivan had $1 for the Wenatchee Wild’s last weekend, and a few other things. Katie had $1 in celebration of the new floors in the VIP lounge where we hold our meetings. We can now freely move our chairs! Kevin had $1 and a Cheshire Cat-like grin over the Cougar’s loss to UW in the Apple Bowl. I (Dominick) had $1 and a shout out for the Beauty of Bronze exhibit currently at the Wenatchee Valley Museum and Cultural Center. More than 500 Wenatchee 5th graders get the chance to become sculptors every year and the result is an interesting social experiment. I recommend checking it out if you get the chance. Brandt Cappel had $1 as well! Club elections next week! That’s an important meeting so don’t miss it. Plus we’ll be hearing from our current inbound student Alina about life in Finland and how she’s finding her year in America. Chelan PUD General Manager Steve Wright speaking to the club, Dec. 12, 2018. We heard an interesting and informative presentation about the strategic plan and fiscal health of our public utility district from General Manager Steve Wright on Wednesday. You can get all the info on the Chelan PUD’s website here. In his new book George H.W. Bush biographer and presidential historian Jon Meacham does an excellent job reminding readers that American history has been never sunshine and roses, but somehow we managed to make significant progress in our relatively short history as a nation. He decided to write it after the tragic events in Charlottesville, as he and the rest of the nation looked on as Klansmen and Neo-Nazis rallied and counterprotester Heather Heyer was killed. It’s an erudite rebuke of the politics of fear and ignorance as well as a step-by-step roadmap of inspiring turning points and game-changing figures in American history. I highly recommend this one. I have a copy on my bookshelf if anyone wants to borrow it (if you can stand my sporadic notations).